‘There was so much in there to take in. It is almost overwhelming to absorb their honesty- their physical honesty and their emotional honesty’. (Feedback from screening). I am really grateful to Marcus Schulkind for supporting this event and thrilled to have collaborated with another dance mentor to host this evening- Neige Christenson. 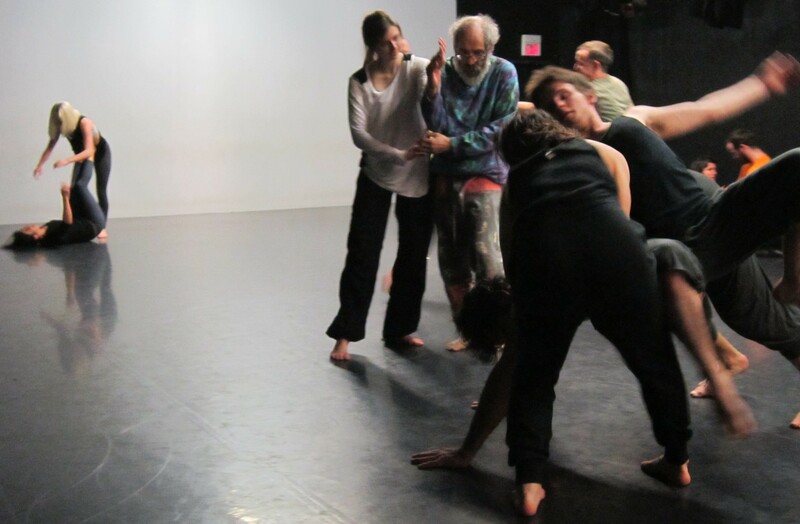 Neige teaches Contact Improvisation in the area and is a supporter of the film. I am a Boston raised dancer but have been living in Europe for the last four years dancing and teaching Contact Improvisation, Modern Dance, and English. I was really excited to bring “Five Ways In” to my home communities and create a mixed event of contemporary dancers, contact improvisers and people who might identify as mover or non-dancers or contact curious. I feel very much at home with both dance communities when I visit from Germany. For me the evening was a great success. Fifty five people saw the film, thirty five attended the class (including some who were giving it a try for the first time) and there were eighteen of us left at the end to clean up. Below, I report some of the feedback and thoughts from the evening. What resonates with you or what image, thought, question, quotation is with you now? Then we discussed our answers briefly in small groups of 2-3. I suggested we group with someone we know less. Then we gathered in a big circle all together and shared. I posed the question: What was meaningful to you in the film? A: I was very moved by the opening scene, the rolling across the floor, because it resonated with an experience I had at a workshop in Southend a few years ago. And I think I said I’m 60 years old and I´m rolling across the floor and I felt like the luckiest person in the world and to me that speaks to what Contact has given me- just to be able to go back to something so childlike and so basic and I feel like it´s such a crime that we are separated from the earth and that kind of activity and there´s no need to be. B: I was really impressed with how able people were to handle their own emotions as they came out through physical touch and through the movement and how much the teachers were pushing people to be able to express their limit setting. I wonder how the community is thinking about ethics for people who may not be able to do that and sort of who is responsible, if, you know trauma is held in our bodies, if things come out and they don´t know how to do that and it´s not a safe space. Particularly with how open it seems that all the living is. I mean I´ve never been, but it seems that everyone is living communally and how you guys are thinking about safe space. C: I appreciated that the lack of diversity was mentioned. This is something that I feel is a lack, as a person of color, I see that a lot. I actually really appreciated that it was brought up and talked about clearly and posed as a legitimate question. D: Following up on that, I liked that there was a little bit of talking about ageism and how it feels to get older in the community as a mover. And all kinds of diversity. I think it was really important that it was acknowledged in a few places. Her reaction to getting older and what that feels like and I really feel that in my brief experience that these things are discussed and faced in a real way in Contact and I like that it was included in the film. E: Contact Improv. may be kind of a skinny-persons form. I was struck by the kind of homogeneity of the bodies and I think that was probably what was at the event. The other thing was that I was honored by these people from all over the world expressing themselves in English. F: There was so much in there to take in. It´s almost overwhelming to sort of absorb their honesty. Their physical honesty and their emotional honesty. But what really struck me was the person who said he realized it was about support and it goes so far. The wonderful image of going through the hands and its´support when you are on somebody´s body supporting the other and yourself and it´s also either emotional support that is being given, the helpfulness of the teachers, the helpers, the whole general support. It was amazing and wonderful. G: Something I was thinking about from the movie and that is the duality between creating an aesthetically satisfying dance and having an emotionally satisfying dance. Ideally you have both. H: So, sort of like the shape versus the internal sensation of it or experience, outer, inner? G: How creatively you interacting with your partner versus how affectionately you´re interacting with your partner. H: What is aesthetic? One criticism I’ve heard for years of Contact performances. : “Oh that looks more fun to do than to watch and if that is going through someone, then how ungenerous an audience is that, you know oh you´re having more fun than me outside so I don´t want to watch it..“ And the woman from Hawaii, I was feeling blue and lonely and then I saw people enjoying themselves and dancing and I felt better. That’s an audience I want to be around. I: For me in the dancing this evening, what was really juicy was having other people with really different dance backgrounds coming in to the space. It brought me in to positions and phrases that I wouldn´t otherwise speak with in my body. It´s also really nice to have movement with people that I haven´t moved with before. I know a lot of people and I know how to move with them and we can get into these little wrote characters that we have and to get outside that is awesome. J: I’ve said this so many times in circle but I think what amazes me again and again about Contact Improv. is just the signature that everyone has such depth and diversity and that it keeps fascinating me. I don’t get bored and even with the same person over time. It’s amazing. K: Yeah, I think that’s really interesting in improvisation in general but definitely in Contact, you bump up against what you want pretty quickly. I feel like it’s such a practice of letting go. -0f what is supposed to be happening of whether its’ “oh this is the lift thing” or “Oh this is the person I danced with yesterday”. “This is the way we dance.” “This is the way I dance in this room.” “This i how I feel about trios”. “This is how I show I feel about duets.” “This person’s too heavy.” All this stuff is like just an amazing practice and not jumping to conclusions. I’m surprised all the time. L: Sometimes it’s challenging to stay patient with what you really need to do for yourself. For me there is this part of me that wants to move really slow and waiting for someone to be there at a distance or with you I find it hard to find that. So I get caught up in a lot of dances that I probably don’t want to do on one level. There’s parts of the dances that I do enjoy though. Just being patient to wait for what you’re at to sink up with the room or it could not happen and being ok with that not happening. Alyssa: I see something different every time. Today what struck me was during the one on one the teacher, Julia said to Camille “How many years have you been a beginner?” Just that question. Not the answer necessarily. This year I’ve been enjoying this question of ‘what is a beginner’ and how do we stay in beginner mindset?” and with that I’m fascinated by the range of intentions, just to think ‘what were our intentions for coming here today, or for dancing in that moment? “ Just that. To imagine that I don’t know what is going on in each of your universes. I love that, that questioning. M: I like how much you can learn about a person by touching their hands. I feel that no matter who you contact with you end up touching their hand at one point and I throughout the class and this experience I partnered with people who were older, who were younger, who were women, who were men, who were sized differently than me, who were pretty much the same size as me and that didn’t impact how we moved so much as I could read more about them from the way they would touch my hand than anything else. N: So I’m relatively new to contact and every single time I’m at a jam whether I’m dancing with somebody or witnessing I’m just in this awe of the everythingness that happens in the dance: there’s awkwardness, there’s patience, there’s joy, there’s fear. It feels like a deep conversation that everybody is engaged in in every role. It just feels like really true expressions of people and of myself and it’s beautiful to see everyone has one point when they are awkward and one point when they are beautiful. And it’s just like we all have it all. I love it and I love this community and I’m so happy to be a part of it now. O: And we want all of you! P: I think that’s something that I appreciate about contact, that everyone is honest. Cause they know that this is their space to be honest with themselves and everyone else. I haven’t been to a jam in a long time so coming back and so this is was like I had to take layers off, it was like a realization of how much I had built things up and then undoing it and getting back to like this is.. I just need to be honest. This is why I came ‘cause I know I can do that and not realizing that and then using my contact improv and muscles again was really informative. It’s a good lesson for me to understand that. Q: For me the things that were said that really ties into the film so much in terms of people dealing with their emotions and the complexity of that and the articulation of all of it. So it really brings another level of awareness to the practice and to the room and specially with the teaching. And actually I want to thank the two of you for how you put this thing together and for putting out so many emails. Neige: It was super fun! 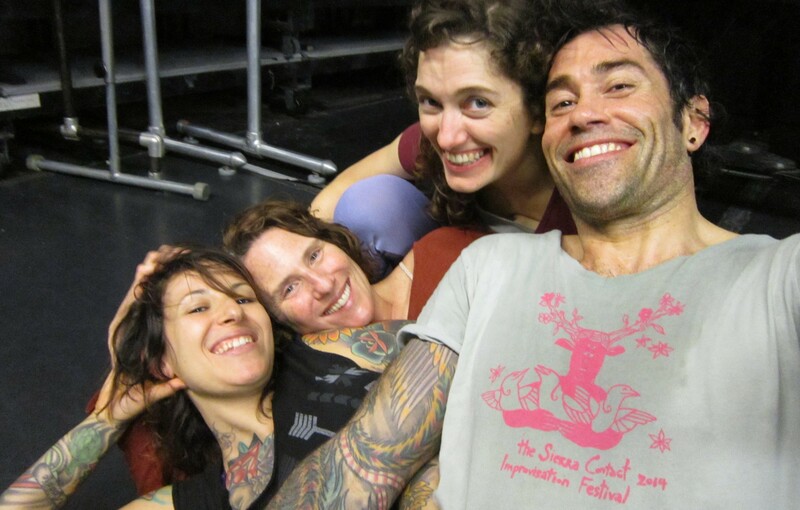 It really worked to get a cross-pollination of the contact improv. world and the more contemporary dance and the people we are calling the contact curious and family members. My brother stumbled in and I was right at the door and like “Take your shoes off!” and then I said- “oh hi Dave” … (laughter) like man with shoes on… And your sister came, right?